Many of us have no idea what “those people” are talking about when they mention endocrine disruptors. Sounds like something foreign and insignificant, or at least it did to me, until something caught my attention a few years ago. It turns out that the endocrine system is a hugely busy and important system in our bodies, one well worth looking into and trying to understand. When we start to understand how important this system is, we might start to notice how we are (unwittingly) damaging ourselves, or rather, being damaged, because there are so many endocrine disrupting chemicals allowed into our daily lives now. It is so much easier to stop causing harm (in whatever ways we are able) when we understand what the problems are, and so difficult, if not impossible, when we remain oblivious. In this case, sticking our heads in the sand will not only harm us, it has the potential to also harm our grandchildren and their grandchildren. The really disturbing thing is, that we are exposed to endocrine disrupting chemicals on a daily basis now. What are some likely routes of exposure to endocrine disruptors? How do we know that endocrine disruptors are dangerous? Should humans be concerned for their health based on evidence that animals have been affected? Is there direct evidence that humans are susceptible to endocrine disruption? Are children at greater risk from endocrine disruptor exposure? These days don’t chemicals have to be safe to be allowed on the market? What can I do to reduce my risk of exposure? “The widely variable substances are present in plastics, PCBs, pesticides and herbicides, pharmaceutical products, and personal care products. While the amounts found in these products are often extremely small, the sheer volume of items containing them makes exposure unavoidable. “Over the past 40 years we have seen a 57% increase in prostate cancer, 40% in breast cancer, 85% increase in hypospadias (penile defects), and a 50% reduction in sperm count . In addition, attention-deficit hyperactivity disorder (ADHD) has increased by 30%, autism spectrum disorders have doubled in the past 10 years , obesity has doubled in the past 30 years , and the number of US adults with diabetes has more than tripled since 1980. Clearly we must look to the environment as the primary cause of such increases because the human genome has not changed over the same time-period. Endocrine disruptors are likely to be a key factor in the surge of many diseases and disorders. They could not perceive that in ten years a pandemic of endocrine-driven disorders would begin to emerge and increase rapidly across the northern hemisphere. And that today, …, hardly a family has not been touched by Attention Deficit Hyperactivity Disorder, autism, intelligence and behavioral problems, diabetes, obesity, childhood, pubertal and adult cancers, abnormal genitalia, infertility, Parkinson’s or Alzheimer’s Diseases. TEDX has also confirmed that the feed stocks for most endocrine disrupting chemicals are derived from the production of coal, oil, and natural gas. It is clear that endocrine disruption, like climate change, is a spin-off of society’s addiction to fossil fuels. “The Disappearing Male is about one of the most important, and least publicized, issues facing the human species: the toxic threat to the male reproductive system. 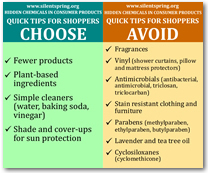 Fragrances in cleaning and personal care products. This entry was posted in Chemicals, Child Health, Environmental Health, Environmental Sensitivities, Multiple Chemical Sensitivities, Public Health and tagged avoid endocrine disruptors, endocrine system, fossil fuels, fragrance chemicals, health, MCS/ES, penile defects, petrochemicals, phthalates, science, sperm damage. Bookmark the permalink. Reblogged this on Health and Medical News and Resources. Thanks Janice, and thanks for everything else you share too. Insurance companies are starting to take endocrine disrupting chemicals seriously. “Human and animal life is widely exposed to many artificial substances that interfere with the sensitively constructed hormonal system. Substances that interfere with hormones are called Endocrine Disrupting compounds/chemicals (EDC). EDCs are a truly emerging risk. There is strong evidence for negative effects on animal organisms and mounting evidence for effects on human health. Evidence is mounting that specific substances are connected to human bodily injuries. For the risk management of liability insurers it is crucial to monitor this emerging risk. A greater clarity regarding the associated costs has to be achieved.